Coming Soon! We’re really excited to be bringing in these beautiful stone-grinder mills from Europe. We are looking for the first ones to come in early 2012. This one looks a little old-fashioned---it’s because it is! This is inevitably the mill that was recommended whenever I asked people who had been baking wholegrain bread for years and years using the same wheat grinder! They’re work horses and they are made to last! 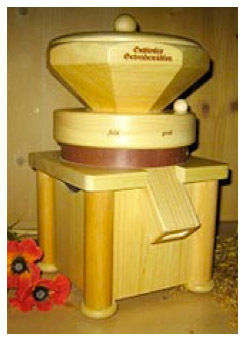 Using natural stones, this mill can grind coarse and ultra-powdery fine and everything in between. Cracked wheat, cornmeal, no problem! Want the finest of finest flours from the hardest beans—it will do that, too! Not only that, but bread tastes much better when the wheat is stoneground! The nutritional value is better because the flour stays cool. 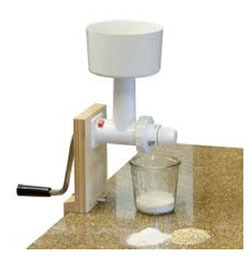 I highly recommend the All Grain Mill for those who are serious about great tasting home baked products! The look hasn’t changed in many years, and neither has the excellent quality! For those of you looking for a good impact grinder, the Nutrimill is a good option. It is much quieter than most impact grinders and has the biggest hopper of any other on the market. This is the hand grinder that I like the best for the price. It is easy to use---Women and children will be able to mill enough flour to make 4 loaves of bread easily. I really like the fact that onto the same hand base unit that you get with the grinder, you can attach several different machines. It is made by Family Grain Mill. It is easy to use—women and children will be able to mill enough flour to make 4 loaves of bread easily. I really like the fact that onto the same hand base unit that you get with the grinder, you can attach several different machines as well. 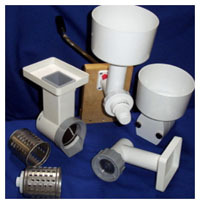 Also available is a Slicer/Shredder (food processor) attachment and a Meat Grinder. 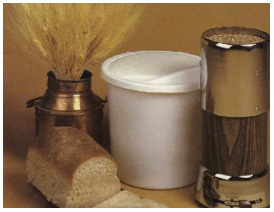 The other advantage of this grinder is that you can purchase an Adapter that will attach the grinder or flaker onto your Bosch or KitchenAid, thus allowing you to use power while you have it. This is a great option to an electric grinder if you aren’t planning on using your mill very frequently. 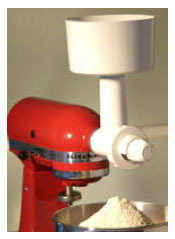 It actually grinds a very nice flour—better than some electric grinders I’ve seen. 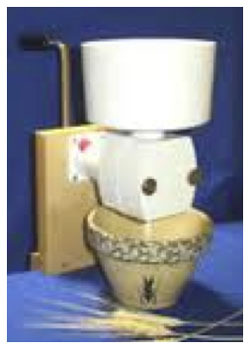 I especially like this adapter for the oat groat roller. 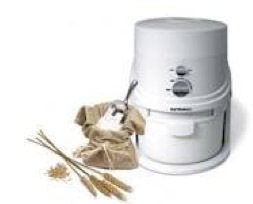 It makes rolling fresh oatmeal for breakfast a breeze! FYI: I am a dealer for Bosch and Nutrimill.